If you're looking for a metaphor for the decline of network news, look no further than CBS's decision to replace Walter Cronkite as the disembodied voice of CBS Evening News with actor Morgan Freeman.Cronkite, the longtime CBS anchor famed as "the most trusted man in America," recorded a voice-over introduction appended to the show when Katie Couric took over as anchor in 2006. The idea was to bestow a little of his ample gravitas on the former Today Show host, about whom it was then all but impossible to talk without resorting to the word "perky." Well, Couric's public image has come a long way since then. And, to be fair, it might strike some people as odd to hear Cronkite's baritone on the air night after night, considering he's dead and all. 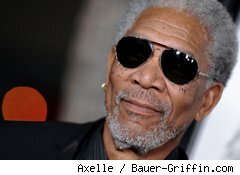 But Morgan Freeman? To be sure, the man has a beautiful way of speaking -- which is why he's been hired to provide the voice for everything from Visa commercials to March of the Penguins. To replace perhaps the most revered figure in television news history with the guy who narrated War of the Worlds -- that's a little sad. When MSNBC started using Twisted Sister singer Dee Snider for promos, at least that was a little original. Freeman is gravitas in a can.